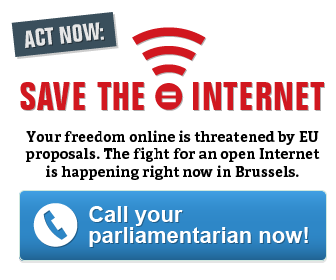 Letter to MEPs: Do not give up Net Neutrality! Paris, 20th April — On 3rd March 2015, the Council of the European Union voted a text endangering Net Neutrality in Europe, despite European Parliment’s position adopted a year ago. Negotiations between the European Parliament, the European Commission and the Council of the European Union (trialogue) started on 11 March in order to settle an agreement on the final version. It is crucial that the European Parliament remains firm on the preservation of Net Neutrality, that ensure equal treatment on the data network and on prices. Infringing Net Neutrality means infringing fundamental rights and liberties of any European citizen. This is why, in order to remind our representatives their responsabilities, La Quadrature du Net sends a letter to Members of European Parliament calling them to reject Council’s propositions and to come back to a real protection of everyone’s rights and liberties. The European Parliament has had so far a fundamental role in the negotiations on the Regulation on the European Single Market for Electronic Communications. It is indeed you, MEPs, who introduced on 3rd April 2014 the Net Neutrality principle as the basis of the respect of rights and freedoms of citizens on the Internet, thus ensuring the access to the Internet without discrimination. Recently, on 26th February, the USA have themselves enshrined Internet as “common goods”, adopting a text empowering FCC, the US regulator of communications, for enforcing Net Neutrality in the US. Yet Net Neutrality is endangered today. The Council of the European Union has adopted on 3rd March 2015 a text that is playing into the hands of powerful telecoms firms, in violation of fundamental rights by removing any reference to Net Neutrality. The Council has ruined the balanced text adopted by the European Parliament that enabled operators to develop innovative access offers (“specialized services”), while providing a strong protection to citizens. By refusing to strictly define Net Neutrality, it upholds the interests of operators and ignore those of citizens. Accepting such a step back would have serious impact on innovation and freedom of communication in Europe and worldwide. Without clear rules on Net Neutrality, the largest Internet Service Providers would become toll bridges that would grant access to their clients regarding their ability to pay and exclude the others. Adopting the regulation in the state would endorse discrimination such as financial discrimination. It would shape the text towards free circulation of content without any / guarantee of protection of / protecting fundamental rights. This would allow a small group of monopolistic industries in the field of telecoms, such as Google, to reaffirm their rights to monoply infringing competition, innovation and freedom of communication. Therefore, there is need to put Net Neutrality in the law as the only way to ensure that the Internet remains open for innovation and a platform promoting Human rights. We need clear european rules, that prohibit any type of network discrimination as blocking, slowering, or pricing discrimination, including services called “zero costs”. We need a real political leadership that recognizes the value of an open, democratic and innovative Internet. We are relying on you and your colleagues in trialogue, on your firmness and your deep sense of European democratic values.